Chef Nick Deverell-Smith has worked with the likes of Marco Pierre White and Gordon Ramsay but now has his own restaurant in the Midlands. Deep in the heart of the picturesque Cotswolds and about a 45-minute drive from south Birmingham, you'll find the remote village of Paxford and The Churchill Arms. It's the quintessential old English village with a pretty church, sheep happily grazing nearby, a dozen or so cottages and the country pub at its centre. There isn't a car park but there's not too much traffic on these country lanes, where everyone leaves their cars. Cosy and elegant at the same time, this is a gastropub at the highest level. Responsible for the mouthwatering menu is Nick Deverell-Smith, who started out training at esteemed Michelin-star restaurant Simpsons in Birmingham alongside other talents like Glynn Purnell. You may recognise him from television appearances on Series 12 of The Great British Menu and BBC's Saturday Kitchen. 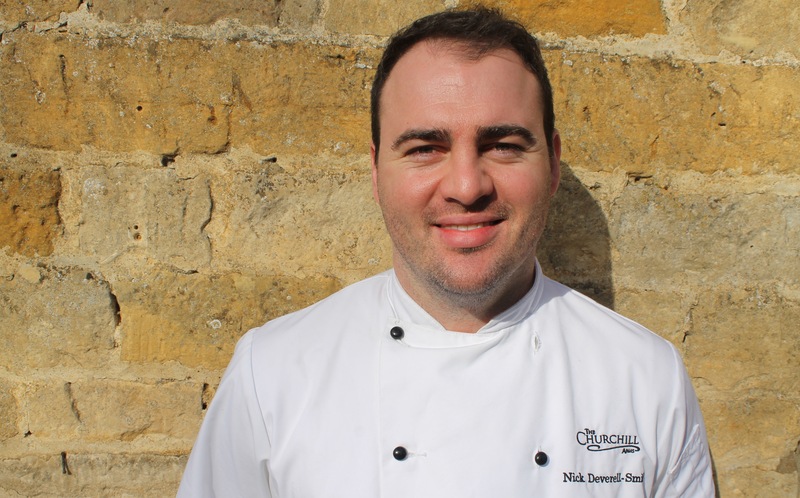 Nick spent several years in London learning his craft from some of the biggest names in food including Marco Pierre White, Gordon Ramsay, Marcus Wareing and Eric Chavot. Earning the post of Head Chef at Soho House and Dean Street Townhouse, he finally followed his dream to open his own restaurant in 2015 - and that's where The Churchill Arms comes in. The restaurant is tucked away but very close to Chipping Campden. It also has rooms for if you want to stay overnight as part of a mini break in this beautiful rural part of the country. There's a welcoming feel to the place. Set within a 17th Century stone building, it feels bijou and historically charming but complimented by stylish modern decor, large photographs of the wildlife grazing in local scenes and a log burner for those cooler evenings. There's an extensive, excellent wine list along with a wide range of ales and beers. Nick champions local produce and tells me that he sources most ingredients from suppliers within 10 miles of his restaurant. The fish is what needs to come from further away, especially being in landlocked Gloucestershire. The menu is updated regularly with Nick's fresh ideas. It's mainly British classics enhanced with Nick's extra touches. Hearty food with generous portion sizes. He prides himself on his renowned chef pals coming out regularly to try his latest offerings. That's signature dishes like his smoked haddock soufflé starter. It's clear to see why his former colleagues travel over from Birmingham and further afield for this. Haddock Soufflé is one of the restaurant's signature dishes. The Soufflé is light and fluffy as it should be, but also flavoursome and creamy due to a chive veloute. It was a dream of a start to any meal and is priced at £8.50. Other starter choices include a delicious silky smooth chicken liver parfait on brioche with hazelnuts and a sharp Granny Smith apple relish on the side (£7.50) or cream of cauliflower soup with homemade bread (£6.50). Also on the menu was Cornish scallop with confit bacon and an onion purée (£12), or Heritage tomatoes with local mozzarella and wild garlic pesto (£8.00). The lamb main course at The Churchill Arms in Paxford. The main course options are extensive with 11 choices. 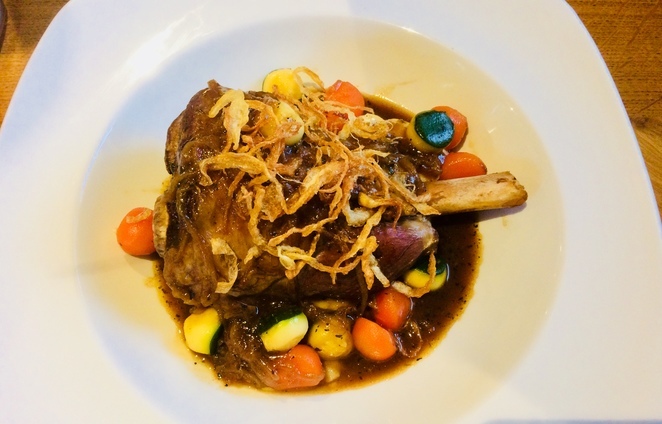 It ranges from a selection of types of steak with frites to a beef wellington for two (£60), pork T-bone (£17.95), asparagus risotto (£14.50) and Cotswold lamb shank (£18.50), to name just a few. The pork comes with a huge slab of crackling on top, but it is so large that the only way you can eat it is to pick it up with your hands and gnaw into it. I didn't mind but maybe the cracking could have done with being presented in smaller pieces to make it easier to cut into or eat more elegantly. That said, it is damn fine crackling. 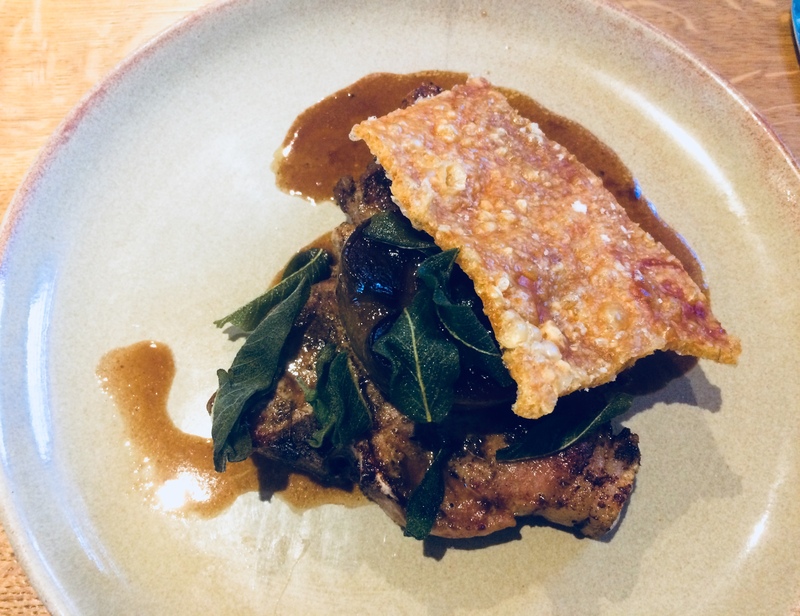 The pork is juicy and plentiful and is balanced out with a sweet baked caramelised apple, sage and mash. Meanwhile, the lamb shank is so tender that it slips off the bone. It comes with local carrots, courgettes and mash. 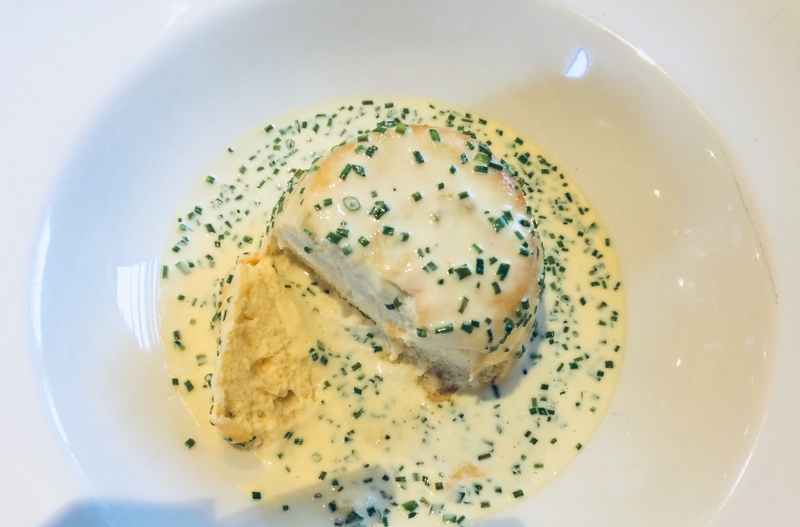 If you do prefer fish, there is plenty on offer too including Cornish lemon sole with local asparagus (£24.50), a fish pie (£16.50) and even pan-fried hake (£19.50). 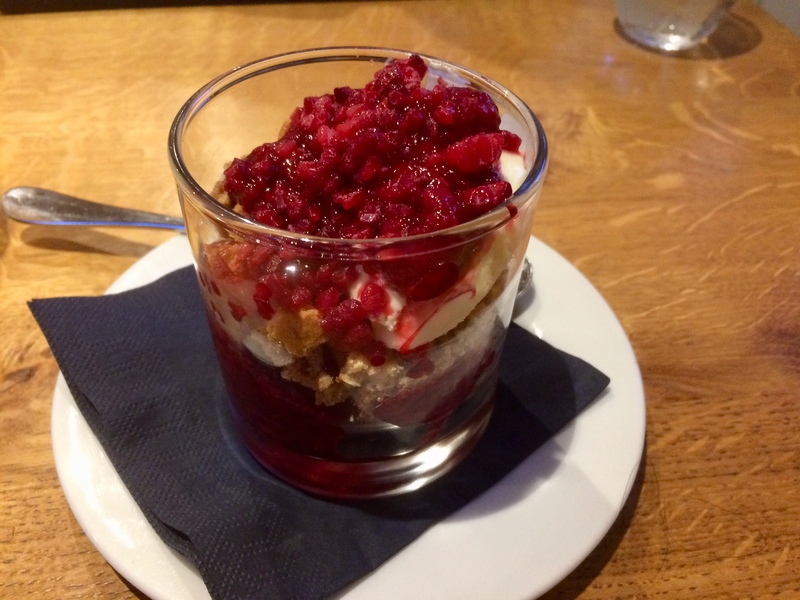 Make sure you leave room for pudding as the desserts are divine. 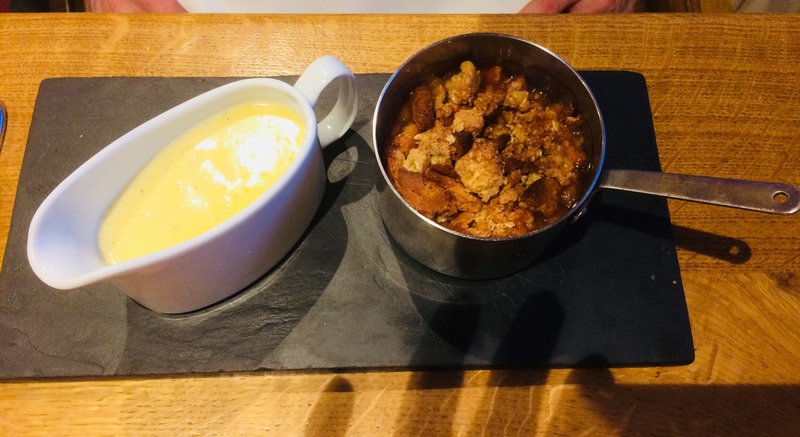 Priced at £7 each, there is a tempting apple tart tatin and lemon drizzle cake with Cotswold cream on the menu but we plumped for a rhubarb and ginger crumble along with a white chocolate cheesecake with local raspberries. It's more of a deconstructed cheesecake in a glass but it comes together beautifully. Although the white chocolate flavour is overshadowed and you wouldn't know it had chocolate in it. That said, it is still a creamy, luscious pudding that will make you want to lick the spoon. The crumble is accompanied by a small jug of piping hot custard. The rhubarb adds a sharp edge to the ginger but it's a welcome sweet and sticky pudding. Also on offer is a sharing dessert for two of a chocolate pudding with glazed bananas (£10.50). 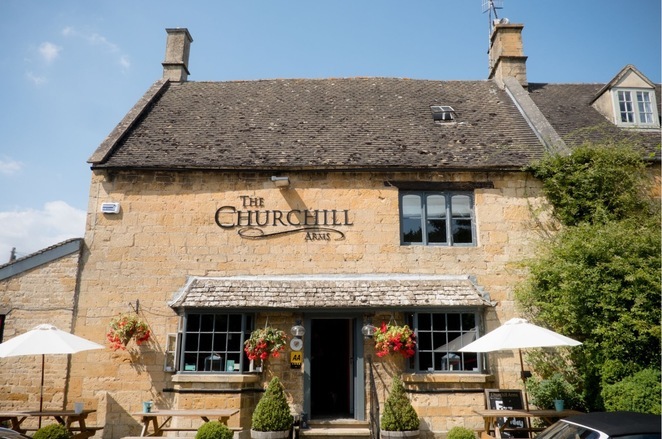 Open seven days a week, The Churchill Arms is fast becoming a busy haven for lunch and dinners so be prepared to book in advance. 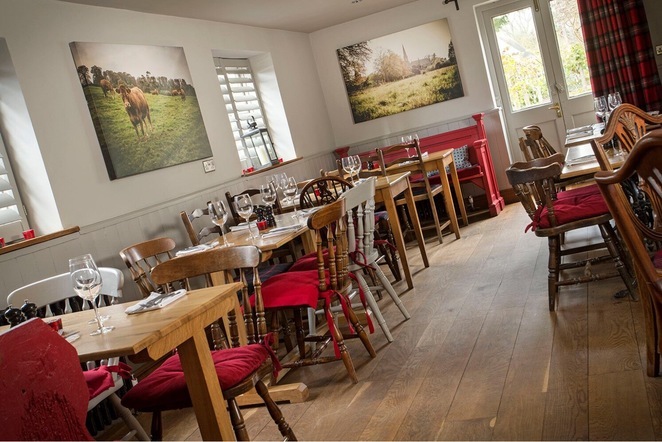 It's well worth it though as this is a rural gem in a beautiful setting with fine wine and even finer food.